What are your thoughts on sexism (or any other discrimination) in zine culture and spaces? What women-created zines and women-zinesters inspire you? How have women shaped zine culture, and how has zine culture contributed to women’s activism? 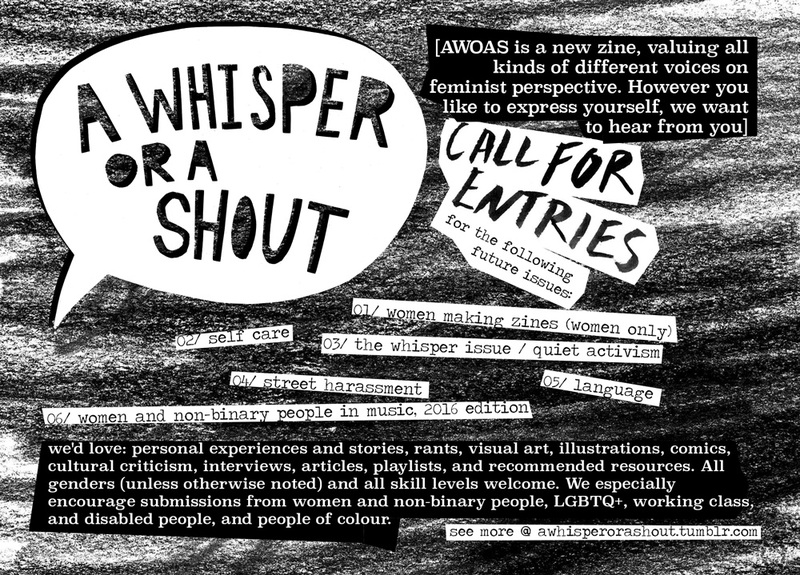 We’re also looking for women to interview on their experiences of making zines and zine culture, contact us if you’re interested! How do you practice self-care, and what are your tips? What makes you happier? What makes you like yourself more? What was your journey to finding self care? Are you critical of how self-care is talked about? Can it be misused against us for corporate means? How do your make your voice heard in the world if you’re quiet, shy, or introverted? What are your alternative forms of protest and rebellion? How can we make our language less oppressive? What’s the history of, or your personal relationship with, a particular word? In what ways can language be a powerful thing? Send us your recommendations of any music made by women and non-binary people that’s released this year, we’ll be making an on-going playlist for people to access and an end-of-year zine. Are you a woman or NB person who makes music? What are your experiences? What about as a music-lover or show-attendee? Do you have reviews, articles, playlists, or general fan-worshipping you’d like to share?